Cupping Therapy is most commonly known as a Traditional Chinese Medicine (TCM) modality, but it has been used by many cultures all over the world. All traditions work with the same principle, the application of cups on the skin surface to create an upward pressure. In many traditions, it is believed that illnesses and imbalances in the body are created by stagnant blood and energy flow. With the upward pressure through the suction of the cups, stagnant blood is drawn to the surface and blood flow increased and therefore the body’s own healing mechanism increased. In Australia most commonly seen are glass, plastic or silicone cups but cups can be made of other materials like bamboo or bronze too. When we talk about muscle, we also talk about the surrounding connective tissue (fascia). We use high quality silicone and non flammable glass cups. According to the needs of the specific area, we will work with movement and/or stationary applied cups. Fascia and muscles are lifted and rigid tissues are released. Cups can be beautifully implemented as part of a Remedial Massage Treatment or as stand alone treatment. In TCM it is believed that cupping will help the energy flow throughout the body and promote overall good health. Cupping can feel less ‘invasive’ and strong as other Remedial Treatments. There are different levels of suction and generally the treatment should not feel painful. The cups draw stagnant pathogens closer to the surface, where the Circulatory System will transport it away. With the increased blood flow more nutrients are delivered to the area and ready to be absorb. As with all deep tissue techniques, specially working and moving connective tissue, the worked area might feel a little sore for a couple of days after the treatment. 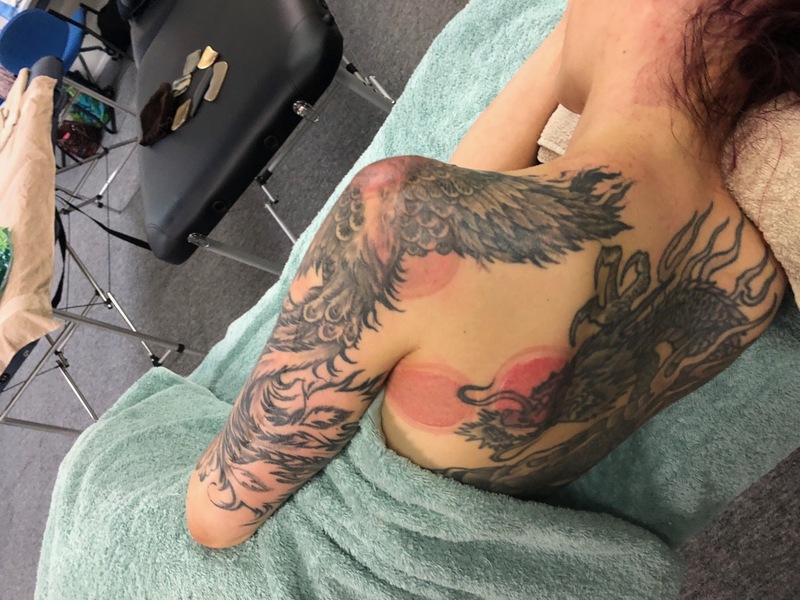 Additionally to the work with muscular tension and fascia restriction, we are trained in relaxing techniques using cups on the face and abdominal region (don’t worry, on the face we will not apply stationary cups and usually will not leave any marks). Our detoxification program is very gentle and relaxing while using lighter pressure as well. Ask us about our special detox and face treatments! Cupping is for anyone experiencing muscular tension, pain or a decrease in their range of motion. Cupping is also a great alternative treatment if a deep tissue massage treatment has been found to be too intense. As already mentioned, the suction of the cup will draw stagnant blood and pathogens closer to the surface to be eliminated by the circulatory system. Cups placed on different areas for the same time and same suction might leave different looking or no marking at all. The different color and intensity is a sign of the difference in pathogens drawn and how chronic the stagnation in this area is. Contrary to a bruise, the marks don’t hurt when touched and don’t go through the typical color changes (purple, orange, yellow…) when disappearing. The treatment is still in progress as long as the mark is still visible. Marks can disappear within minutes up to 10 days. We are so excited to add Modern Cupping Therapy to b3. After witnessing and experiencing the outcomes of this treatment, it is safe to say we didn’t need Michael Phelps to convince us of its effectiveness!